Movie Review: Despite the fondness I have for the solid work of Jesse Eisenberg, reinforced recently by his marvelous performance in “The End of the Tour”, the actor was relegated to a half-depressive, half-sensitive, programmed puppet in the action-comedy flick “American Ultra” by the Iranian-British filmmaker Nima Nourizadeh, who directed according to a script by Max Landis (“Chronicle”). The skilled Eisenberg plays Mike Howell, an apparently common American citizen who works as a clerk in a West Virginia convenience store, likes to smoke pot, struggles with common panic attacks, and loves his girlfriend, Phoebe (Kristen Stewart), more than anything in the world. But after all, nothing is so simple, and Mike is a highly trained CIA agent who is suddenly ‘activated’ by his former supervisor, Victoria (Connie Britton), when she learns that her ridiculous rival, Yates (Topher Grace), plans to destroy him - the one who she considers an asset of several past missions and whose memories were erased. His activation means that the confused Mike (‘am I real?’, he asks), who finds out that his beloved Phoebe is also a CIA agent, is turned into a killing machine that instantly and brutally responds to any attack or threat against him. Mike has to deal with Yates’ operatives, in particular, a psycho called Laugher (Walton Goggins), but counts on his dealer friend, Rose (John Leguizamo) - just another shallow character - to help him survive. Evincing a debilitated script, “American Ultra” promises gold, but delivers pinchbeck instead, shooting in every direction and struggling to find its own voice in the mix of genres embraced. Unfortunately, whether on comedy or action, the film is far from pleasing. Mr. Nourizadeh’s intentions to make the film look like wild and stirring, and at the same time sound funny, were thwarted by his own sense of urgency. He depicts chaos in a thin, occasionally extravagant way, also failing to reach the immediacy of a good joke. 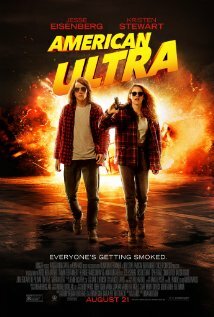 Everything seems hackneyed, from the protagonist to the side characters, and in the end, we may categorize this one as AUFF or an American Ultra Formulaic Film.